We at TFD Instruments understand the relationship that musicians develop with their instruments, and it is for this very reason that we pride ourselves on an exceptionally high standard of repairs and restoration. We specialise in repairing guitars, irish bouzoukis, mandolins and all other fretted instruments. Refers to the instrument being in tune along the fret board. An easy way to check the basic intonation of a guitar is to hit the 12 fret harmonic and compare the pitch with a note fretted at the same fret. If the fretted note is sharp that means the string needs to be lengthened. If flat, it needs to be shortened. Over time the correct intonation of an instrument shifts and would then be in need of resetting. If not reset, your instrument will not play in tune. A good instrument can be hard to play when the strings are too high off the fret board and if too low will cause the strings to buzz. To correct this requires a simple adjustment and is well worth doing. It is part and parcel of a good set up and makes playing the instrument much more enjoyable. No matter what type of stringed instrument you play the nut is a very important part of the overall tone and playability of the instrument. There are many different types of nuts one can use, I myself prefer to use a bone nut as I feel this transfers both sound and tone very well. String buzz is a common problem on all instruments. There are any number of reasons for string buzz. Fixing the buzz is a process of elimination. Certain parts of any instrument are more prone to wear and tear than others, where the finish on the instrument begins to wear off in places. This can be resprayed and blended in or re-oiled. This is important as it stops moisture getting into the wood creating a greater problem. The neck on an instrument is adjusted by loosening or tightening the truss rod. The neck may need adjusting after changing string gauge or when temperature and humidity change the amount of bow in the neck. Back bow causes the strings to buzz, however too much relief makes the instrument hard to play. The correct amount of relief is very important for playability of an instrument. Over time the frets on an instrument wear and you find grooves begin to appear. When the grooves become too weak the strings begin to buzz and the instrument will not play in tune (as the string is hitting the fret in front of the damaged one). At this point your instrument needs to be partially refretted. Acoustic guitars suffer from neck angle problems. In most cases acoustic guitars are are glued to the body making it difficult to reset. Bolt on guitars are more forgiving when it comes to resetting the neck. If the neck angle has shifted it makes the guitar very hard to play when you move up the neck. To fix this problem the neck must be fully removed from the body and the correct angle reset. It is a major job but on a good guitar it is well worth doing. Your acoustic saddle is very significant when it comes to raising or lowering the distance between your strings and the fretboard. This gap is often referred to as action. The correct height of the strings off the frets is made at the 12th fret and this height is very important as to how the instrument plays. Again I would prefer to use a bone saddle as I find it transfers sound very well. If your frets are beginning to wear, rather than wait until grooves appear in them, they can be redressed using a fret file giving your frets a longer life. 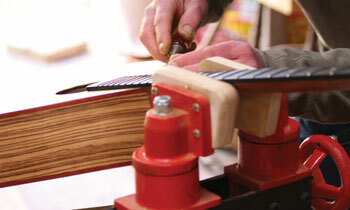 It is also a good time to have your fret board cleaned and re-oiled. The wood on old instruments can crack over time or it can happen due to a fall. These cracks can be repaired. However, a deep crack when repaired will always show a crack line. Scratches are inevitable with all instruments. Most people don't mind them once their instrument plays correctly. However if you are one of those people who prefers a scratch free instrument these scratches can be buffed our and the finish restored. Old instruments are often in need of restoration, for example, old guitars may need new frets, nut or saddle. Also a fret board may need re oiling and so on. This type of work give an instrument a whole new feel and allows you to enjoy playing it again. This requires the instrument to be completely stripped down and taken back to the bare wood and re-laqeured. A full body spray will give your instrument that just-bought feeling. These areas can be relaquered and buffed up giving your instrument an even finish. The weakest part of any instrument is where the neck meets the headstock. This area takes all the pressure of the string tension. If the instrument falls and lands on this area it can cause a complete separation of the headstock from the neck. This can be fixed and the instrument brought back to it's original state. Complete rebuild can vary in degrees i.e. it could require a new fretboard, saddle, veneers, full body spray, new binding and so on. Every instrument is at a different stage of life and requires more or less work depending on it's condition.